I have a 10 year old pittbull/mastif mix. When he was 7 weeks old I noticed the lymphnodes under his cheeks were larger than normal. I took him to a vet and I was told they were symmetrical and most likely nothing to worry about. At ten yrs. old he is very active, loves to swim, jump, eat, play and run around like crazy. 30 days ago everything changed. I came home and noticed he had 2 dime sized patches of fur missing from his right side. I took him to the vet and he was treated for fleas with advantix. The vet was concerned it was lymphoma related and the only way to find out was with a $2000.00 biopsy. About 7 days later these dime sized spots were everywhere so I contacted the vet and he was treated for "hot spots." After a week of cephalexin and an anti inflammatory shot all seemed to be healing. On October 7th I noticed 2 spots on his head that had the same characteristics as the previous spots on his body so I cleaned them with peroxide and called the vet. 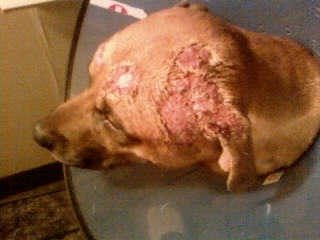 That night the dog itched his face so bad a 4x2 inch patch of his skin was completely gone and oozing pus the next morning. the time so there is no way for him to scratch but it got bigger overnight and became very inflamed. Now that spot is also no longer infected and getting better everyday. However this morning I woke up to a whole new spot above his right eye oozing, red and very swolen. It smells awful, looks painful and Im getting very frustrated. I never missed a dose on his medication. I keep the areas very clean and make sure they are completely dry. Why is this spreading? What could be causing patches of his fur to fall out, ooze pus, and continue to get bigger and bigger. The spots are only on his head now and I Would love some help or hope for that matter. I am sorry to hear of Zeus’ condition. It sounds like he has a serious, underlying condition that is causing him to develop pockets of infections in his skin. Your current treatment seems to deal with the infections as they erupt, but the underlying condition remains, which is why new spots are developing. To figure out what is going on, your vet is going to have to run some diagnostic tests. If Zeus were my patient, I would start with blood work, a skin scraping to look for mites, skin cytology to look for yeast and bacteria and a fungal culture. If the answer wasn’t obvious with these tests, a skin biopsy would be necessary. The costs of all this does add up quickly, but I’m afraid it is the only way to get to the bottom of what is going on with Zeus. I agree if this were my dog I would ask for blood tests since a lot of times these skin issues are from internal issues.. My heart breaks for this furry he looks so uncomfortable to say the least & shouldn't he be on an antibiotic. Best wishes for the doggie .. I am a mom to a 4 year old Pekingese. He has bald spots that grow to the size of the palm of my hand. Red, irritated and painful. I keep going to the veterinarian at least twice a month and she just keeps doing the same thing, a steroid adn antibiotics. Never tries to figure out underlying problem. I think some vets are in it for the money and nothing more. I am very frustrated. I tried a food change. Vitamins for the immune system are all very expensive. I still have the same problem. I'm so lost and broken hearted for my furry boy. He is always in so much pain.